Last week, I received a Swish gift pack from the bloggermail courtesy of Unilab. 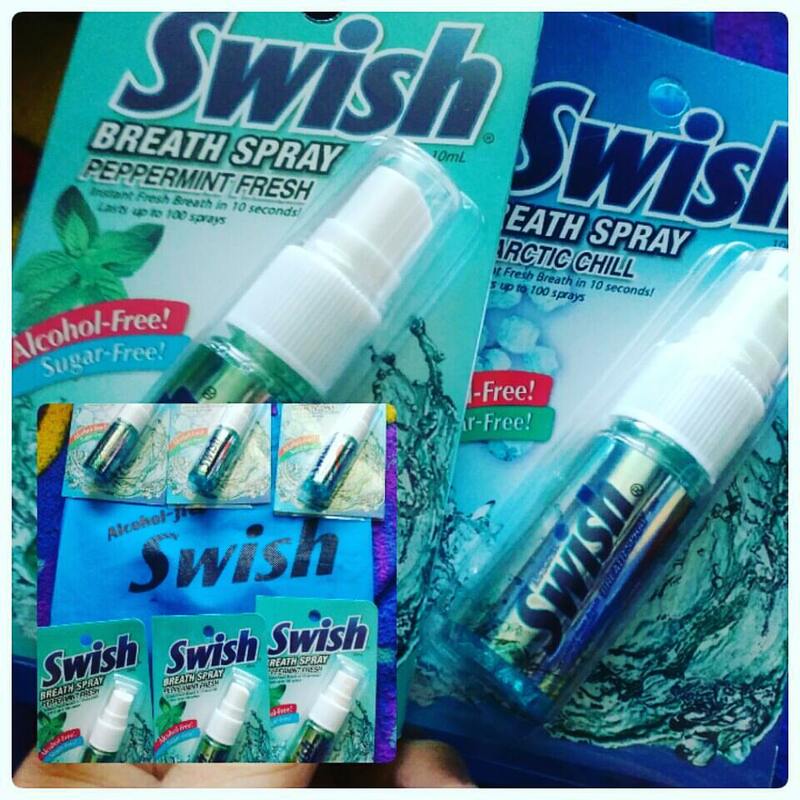 The gift pack contains Swish Breath Spray products to help fight bad breath. After trying it out for days, I've decided to come up with a product review. The most common cause of bad breath is poor oral hygiene. Bacteria that build up on your teeth – particularly between them – as well as your tongue and gums, can produce unpleasant-smelling gases. These bacteria are also responsible for gum disease and tooth decay. If you don't floss and brush your teeth regularly, any food trapped between your teeth will be broken down by the bacteria and may be responsible for bad breath. Bacteria can also live on the rough surface of your tongue. As well as brushing your teeth, cleaning your tongue can also help control bad breath. Eating strongly flavoured foods, such as garlic, onions and spices, is likely to make your breath smell. Strong-smelling drinks, such as coffee and alcohol, can also cause bad breath. Bad breath caused by food and drink is usually temporary. It can be avoided by not eating or drinking these types of food and drink too often. Good dental hygiene will also help. Smoking is another cause of bad breath. As well as making your breath smell, smoking stains your teeth, irritates your gums, and reduces your sense of taste. It can also significantly affect the development of gum disease, another major cause of bad breath. When you stop smoking it will lower your risk of gum disease and help prevent bad breath. Crash dieting, fasting, and low-carbohydrate diets are another possible cause of bad breath. They cause the body to break down fat, which produces chemicals called ketones that can be smelled on your breath. Bad breath can be really embarrassing and it can make social situations uncomfortable, and it's not pleasant to experience. Maintaining good oral hygiene is the key to beating bad breath. Swish Breath Spray is a must in my purse for instant fresh breath in 10 seconds quickly killing germs and bacteria in the mouth. The size is very convenient! The flavor is very mild and it doesn’t have any burning sensation. I can really feel that it works on its own to eliminate bad breath caused by eating, drinking and even smoking. It’s very handy and helpful to get instant fresh breath. The best part? It’s alcohol free and sugar free that is safe to use anytime. 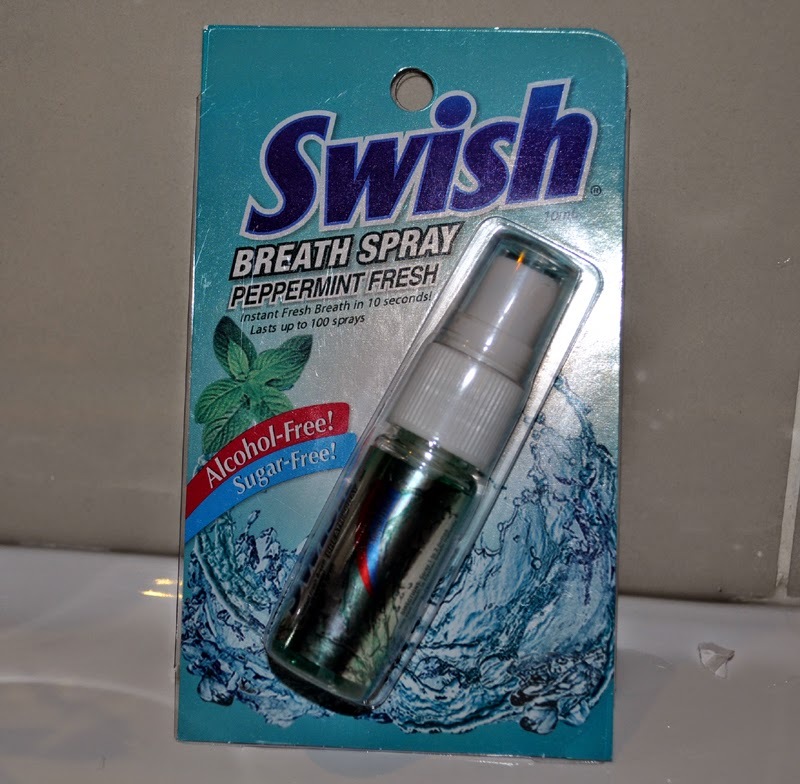 Swish Breath Spray is clearly the best breath care product out there. It does not have the unpleasant taste of other popular brands---and it truly freshens your breath! It gives you more sprays/usages (lasts up to 100 sprays!) than any other breath care product and is more affordable. This breath spray comes in two minty flavors: Arctic Chill and the more traditional Peppermint Fresh. It's small enough to do two things—fit in a clutch and not scream "My breath stinks!" when you use it. Pocket sized to join you wherever you need to refresh. Lattes, French onion soup, delicious garlicky Parmesan fries—this is the rare breath freshener that covers all sorts of smells for hours. Hygienic bonus: The bottle is very handy and shuts well, so it doesn't get grimy in your bag. Spray into mouth any time you need a little refreshing. Remember to always spray before kissing or close-talking! The rinse had a nice mint flavor and has pleasant after taste. ♥ My breath was very fresh after each use. ♥ Very economical as each bottle can last up to 100 sprays. I use Swish Breath Spray as refreshing pick-me-up. It tastes great and also has an overall cooling effect with the peppermint and menthol, as I get over-heated easily.This breath spray is great! This product actually made me stop using sugary mints. The price is in line with what you would pay for other sprays and it fits right into my bag or even pocket. Works well and the mint is refreshing.